In 1820, the ships Maro and Rambler of Nantucket, commanded respectively by Captains Joseph Allen and Benjamin Worth, in company with the Syren of London, rendezvoused at the Sandwich islands. One of the principal benefits to the economy of the Islands was the rendezvousing of the Pacific whaling fleets from the US and other countries at the various ports of the islands for many years, and the transshipment of oil and bone from these ports. It was that year, after his discovery of Gardner Pinnacles, that Captain Joseph Allen on the Maro, sighted and named the reef after his whaling ship, Maro. Maro Reef has less than one acre of periodically emergent land; at very low tide, only a small coral rubble outcrop of a former island is believed to break above the surface. As a result, Maro supports no terrestrial biota. It is also one of the chain’s most ecologically rich shallow water marine ecosystems, with 64-percent coral cover over the entire area, among the highest percentage observed in the Monument. Unlike the classic ring-shaped atoll, Maro is a complex maze of linear reefs that radiate out from the center like the spokes of a wheel. The documented marine biota at Maro Reef includes 37-species of corals and 142-species of reef fish. Fish species endemic to the Hawaiian Archipelago make up half of all fish recorded here. Maro’s reefs are intricate and reticulated (like a net or network,) forming a complex network of reef crests, patch reefs and lagoons. Deepwater channels with irregular bottoms cut between these shallow reef structures. As Chair of the Board of the Land and Natural Resources I made the recommendation to the rest of the BLNR (and we then voted unanimously) to impose the most stringent measures to assure protection of the Northwestern Hawaiian Islands. In helping people understand why, I have referred to my recommendation to impose stringent protective measures and prohibit extraction as the responsibility we share to provide future generations a chance to see what it looks like in a place in the world where you don’t take something. Koʻanakoʻa (Maro Reef) is now part of Papahanaumokuakea Marine National Monument, a State and Federal (State of Hawaiʻi, Department of the Interior’s US Fish and Wildlife Service and the Commerce Department’s National Oceanic and Atmospheric Administration) co-managed marine conservation area. The monument encompasses nearly 140,000-square miles of the Pacific Ocean – an area larger than all the country’s national parks combined. Kupuna means elder, grandparent or ancestor. The islands to the northwest of the main Hawaiian Islands have been referred to as the Kupuna Islands. The Hawaiian chain is made up of volcanic islands. Hawaiʻi sits over a ‘hot spot,’ the Hawaiian hot spot. The Pacific Plate is moving over the layer in the Earth known as the Asthenosphere. This movement takes it to the northwest. As the plate moves over a fixed spot deeper in the Earth where magma (molten lava) forms, a new volcano can punch through this plate and create an island. As the plate moves away, the volcano stops erupting and a new one is formed in its place. With time, the volcanoes keep drifting westward and getting older relative to the one active volcano that is over the hot spot. As they age, the crust that they sit on cools and subsides. This, combined with erosion of the islands, once active volcanism stops, leads to a shrinking of the islands with age and their eventual submergence below the ocean surface. Maui is made up of two volcanoes, Haleʻākala and West Maui (about 1.32-million years ago.) Kahoʻolawe and Lānaʻi were each formed by a single volcano of their respective names. They are all part of the Hawaiian-Emperor Volcanic Chain. About 40-million years ago, the Pacific Plate changed direction from north to northwest – so the Emperor Seamounts run more north-south, the Hawaiian Ridge north-westerly. Midway Island is 27.7-million years old; Meiji Seamount the northern part of the Emperor Seamount (near the end of the Aleutian chain) is about 80-million years old. If all of Earth time from the very beginning of the dinosaurs to today were compressed into 365 days (1 calendar year), the dinosaurs appeared January 1 and became extinct the third week of September. When I was at DLNR, President George W Bush created the Northwestern Hawaiian Islands Marine National Monument on June 15, 2006. Seeking a more appropriate Hawaiian name for the monument, suggestions for a name change were submitted. The Kumulipo, the creation chant, tells of the history of how all life forms came and evolved from Papahanaumokuakea, beginning with the coral polyp – the building block for all life. Papahanaumoku is a mother figure personified by the earth and Wakea is a father figure personified in the expansive sky; the two are honored and highly recognized ancestors of Native Hawaiian people. Their union resulted in the creation, or birthing, of the entire Hawaiian archipelago. The naming of the monument is to honor and preserve these names, to strengthen Hawaii’s cultural foundation and to ground Hawaiians to an important part of their history. We were born in the Islands; I have been fortunate to have visited her home island on several occasions. She has flown over 3-million miles; I have over 1-million miles in my Hawaiian Air account. She lives on Midway, at least during the breeding season she can be found there. She is joined by about a million other Laysan albatross, there. She has had around 35 chicks, nesting each year within 15-feet of prior years’ nests. 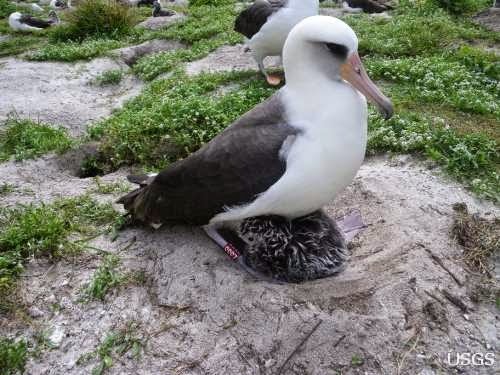 She’s the oldest known wild bird. The Laysan species of albatross traditionally mate with one partner for life and lay only one egg at a time, each year. It takes much of that year to incubate and raise the chick. Laysan albatross are black and white seabirds named after Laysan Island. They stand almost 3-feet tall, weigh 6 to 7-pounds and have wingspans of more than 6-feet. They spend most of their days out at sea and spend hours gliding on headwinds – they eat mostly fish, fish eggs, squid and crustaceans. Laysan albatross live on both land and sea. The birds spend nearly half the year in the North Pacific Ocean, touching land only during breeding season. Its traditional name ‘moli’ means a bone tattoo needle, which was made from the bone of an albatross. The Mariner’s act of shooting the albatross (that had once brought good luck to his ship) is the mother of irrational, self-defeating acts. He never offers a good explanation for why he does it, and his crewmates get so upset that they hang the dead albatross around his neck as a burden, so he won’t forget what he did. The US was inspired to invest in the improvement of Midway in the mid-1930s with the rise of imperial Japan. In 1938 the Army Corps of Engineers dredged the lagoon during this period and, that year, Midway was declared second to Pearl Harbor in terms of naval base development in the Pacific. The reef was dredged to form a channel and harbor to accommodate submarine refit and repair. Patrol vessels of the Hawaiian Sea Frontier forces stationed patrol vessels at most of the islands and atolls. In 2000, Secretary of the Interior designated Midway Atoll National Wildlife Refuge as the Battle of Midway National Memorial, making it the first National Memorial designated on a National Wildlife Refuge. The image shows Wisdom and her chick. (USGS) In addition, I have added other related images in a folder of like name in the Photos section on my Facebook and Google+ pages.